I have a data set that I want to return an indexed column using two values: a year and a name. Both these values are formatted to general (I also tried text) in my spreadsheet. I am trying to do a lookup on the joined year and name and return the given number in the second table. 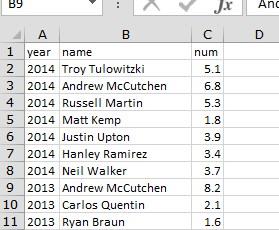 For instance 2013Andrew McCutchen would return 8.2, and 2014Andrew McCutchen would return 6.8. Currently, I only get the #N/a value with the following"
But, I know a certain value is in the table though because I have tested with an if statement to make sure my spelling is correct. Any guidance would be much appreciated. In your match expression, you are comparing one concatenated value $J$1&C3 to another single concatenated value '2006 Results'!$A$2&$B$556. Match expects that second parameter to be a range rather than a single value. In cases like this, where multiple criteria are required, I prefer to use sumifs rather than index-match, even though the intention is to return a single value. I think =SUMIFS('2006 Results'!$C:$C,'2006 Results'!$A:$A,j$1,'2006 Results'!$B:$B,$c3) will give what you need and should correctly copy to the other cells in that table.